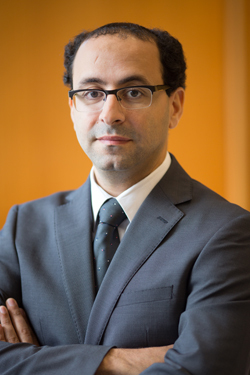 Ahmed Aboumohamed, MD is an Attending Physician and an Associate Professor in the Department of Urology at Montefiore and our Albert Einstein College of Medicine. Dr. Aboumohamed's areas of expertise include urology, urologic oncology, minimally invasive and robotic surgery, and urologic reconstruction. Dr. Aboumohamed earned his medical degree, as well as clinical masters and clinical doctorate degrees in urology from Cairo University School of Medicine. He completed his medical internship and urology residency at Cairo University. He was subsequently appointed as a faculty member at Cairo University. Additionally, he was a fellow at Cleveland Clinic; Roswell Park Cancer Institute; Wake Forest University Baptist Medical Center; and Montefiore. Dr. Aboumohamed's research includes minimally invasive and robotic surgery for urologic malignancies, and the treatment of complex urethral reconstruction. He has numerous publications including peer-reviewed articles and book chapters. His research has been published in multiple peer-reviewed journals including Journal of Urology, British Journal of Urology International, and Urology Gold Journal. He is a member of the European Association of Urology (EAU) and the American Urological Association (AUA).